The death of King Abdullah has caused a slight uptick in oil prices on the world market. However, analysts believe that this price increase will be only temporary and do not expect changes in Saudi Arabia's oil policies. However, some experts think there can be changes in bilateral relations between Russia and the Saudi Kingdom. The world oil market reacted to the death of King Abdullah of Saudi Arabia with an almost two-percent leap in oil prices with trading up to $47 a barrel. The Saudi Arabian government, which is the world's largest oil exporter, will now be led by Abdullah's 79-year-old brother Salman. His heir will be Crown Prince Muqrin. Until the death of King Abdullah Saudi Arabia maintained a firm stance within OPEC regarding quotas on oil production and was categorically against its reduction. The policies of the kingdom, which on many occasions had said that oil would never again cost $100 a barrel, had disappointed a market that had been hoping for growth. But now there are expectations that the Saudis will change course and oil prices reacted to the news of the king’s death with a price leap during trading on Jan. 23. However, experts do not predict any substantial changes in the kingdom's oil policies. However, there are optimistic forecasts concerning other foreign policies, including those with Russia. Experts say that movements on the oil market are due exclusively to speculation that Saudi Arabia will change its policies upon the enthronement of King Salman. That is why "oil quotas in the near future may demonstrate diverse movements," said Alexander Kudrin, head of the strategic energy research directorate at the Analytical Center of the Russian Government. "Speculators are just using this event to profit from the price increase and slightly recover their losses from the previous price decrease," says Vladimir Milov explaining the sudden growth. Milov, general director of the Institute of Energy Policy thinks that it is futile to expect complacency regarding Saudi Arabia's oil policies, as the kingdom is afraid of losing its market share if it reduces production. Nevertheless, there will be an increase in oil prices, just not now, says Milov. "In the second half of the year, closer to the end, prices will resume the level of $70-80 a barrel. The market will not be able to withstand the current levels for a long period due to the oversupply of oil, but also, and primarily, to production in the deepwater shelf." Will there be diplomatic warming? 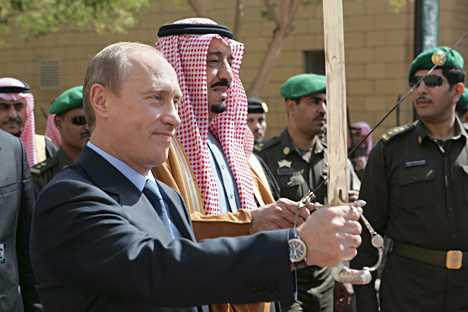 The future of bilateral relations between Russia and Saudi Arabia is uncertain. "Regarding the Syrian question, we were, are and will be Saudi Arabia's enemy," said Yevgeny Satanovsky, political analyst and president of the independent Middle East Institute. "We didn’t change our policies during the reign of King Abdullah and we will not change anything during King Salman's reign." In Satanovsky's opinion, changes in Russia's policies can only be expected when power will be assumed by a younger generation of Saudis. However, the new king will adhere to the moderate wing of the political establishment, "which is rather heterogeneous and includes various clans," something that raises certain hopes, believes Andrei Fedorchenko, director of the Center of Middle East Studies at the Moscow State Institute of International Relations. "And changes in staff may rather quickly and positively alter Saudi Arabia's policies on Iran, Iraq and Syria, which is obviously in Russia's interests," adds Fedorchenko. At the same time Fedorchenko does not expect any major shifts in the political landscape. He does, however, forecast new opportunities in investment cooperation and in the social sphere, in areas such as religion. Discussions on creating areas of collective security in the Persian Gulf may also be revived. "Russia had proposed this idea in 2007, but it was never implemented due to the escalation of the situation in the Middle East," remarked Fedorchenko. "Now the project might be developed."